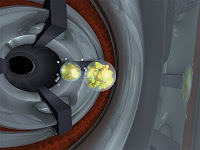 Heavy elements like atomic number 118 were created by smashing calcium-48 ions into americium-243 target atoms, shown in this illustration. Credit: Thomas Tegge, Lawrence Livermore National Laboratory. A quest is underway to create larger and larger atoms with more protons and neutrons than ever before. By building these super-heavy elements, scientists are not just creating new kinds of matter – they are probing the subatomic world and learning about the mysterious forces that hold atoms together. "Of course discovering something new is always very interesting, but the main motivation is, we don’t understand how nuclei work out in these extreme limits," said Dawn Shaughnessy, a chemist at Lawrence Livermore National Laboratory in Livermore, Calif. The scientists are also working toward a tantalizing goal: They hope to discover a theoretical "island of stability" where ultra-large elements all of a sudden become easier to make. While most extremely heavy atoms disintegrate in fractions of a second, theory predicts that once elements reach a magic number of protons and neutrons, they become relatively stable again. Finding these magic numbers could also provide revealing clues about how atoms work.